When I was in graduate school, I lived in an apartment with two roommates, and the three of us rotated the household responsibilities of cleaning and cooking. During a week when it was his turn to cook, my one roommate told us about a free dinner on campus. At the time, I was seeing a girl I had been dating throughout college, but that night I talked for two hours with a girl that sat across the table from me at the free church dinner. The girl’s name was Juanita, and I was intrigued by her. That same night, I broke off the relationship with the girl I had been dating. Unbeknownst to me, Juanita, who was planning to be a single career woman, ran back to her dorm, threw her books on the floor and angrily declared to her roommate that she had met the man she was going to marry. (She was furious because she didn’t want to get married.) Three months later, we did, and we have been married for 53 years. I joined the Air Force and Juanita and I traveled all around the United States. We also spent four wonderful years in Germany. I served as a commander and also worked in the White House as a communication officer for President Jimmy Carter. Juanita and I had a very interesting and blissful life, along with a steady income. What is different about our life now is that I have Alzheimer’s. Juanita takes on more responsibility now as my care partner. There is more stress on her, and more guilt on me. I feel guilty that she has had to give up some of her life to be responsible for our lives. She doesn’t have as much “me” time, and although we spend more time together, we decided to give up life in a 3000-square-foot home to move into an apartment in a senior living community. The wonderful thing about the community, however, is that we have a 125-resident support group, and there are quite a few couples like us. We have activities to participate in and new people to meet all the time, so our life is as good as it can be given our situation. Juanita leads a caregiver group that she started all on her own. Her previous work as a mental health counselor is a huge blessing for me and the others who participate, and she also gets a great deal of joy in helping people. Looking back, we were more prepared than most. As soon as Juanita noticed cognitive changes in my behavior, she encouraged me to see a doctor. The straw that broke the camel’s back was the “kitchen cabinet incident.” Juanita had asked me to get a pan from a cabinet I had been using for decades. She watched as I struggled to get it to open. I thought the door was stuck, and kept pulling and pulling. Finally, she said: “Honey – try the other side.” The cabinet opened immediately. Juanita has been by my side every step of this journey since I was diagnosed five and a half years ago. 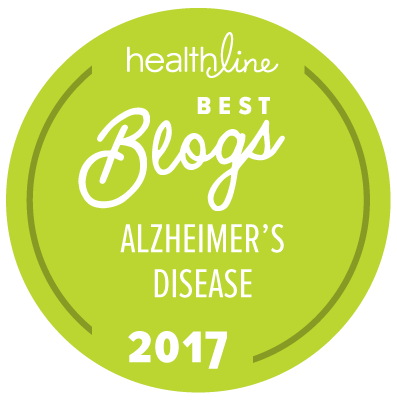 I have a family history of Alzheimer’s and I knew the disease was potentially on the horizon. We were lucky in that we were somewhat prepared for it. I went to seminars and educated myself so that I was able skip the phases of anger, denial and grief and go straight to acceptance. Juanita was right there, ready to step into her new role, always so supportive and helpful. She is calm under pressure, intelligent, creative and bounces back quickly from any frustrations. She makes my emotional life easier by being so extremely patient. We still love to kid each other, although I now often miss the nuances. She is cheerful and has a wonderful sense of humor to this day despite how hard the situation can be on her. I want her to know how much I love her. Caregivers and care partners don’t expect much appreciation, but they should celebrate the moments when they are recognized, because they deserve it. People with Alzheimer’s often go about life unaware of how much caregivers are giving and can’t show the appreciation for their sacrifice. So much attention is put on the person with Alzheimer’s instead of the caregiver, and I hope to see this change in my lifetime. I want to see more formal attention given to the caregiver side of the house. I don’t think that there can be ever be enough support for caregivers. Many people do not know how overwhelming and isolating caregiving can be. We need to support caregivers more now than ever and give them what they need. Caregivers, stay patient. Don’t give up. What’s the old saying? “When the going gets tough, the tough get going.” There is so much expected of caregivers, and the reality is that they can’t be everything to everyone. Don’t let them fade into the background. Support them and let them know their worth. They are our lifeline. I know Juanita is mine. About the Author: Bob Wellington was diagnosed with Alzheimer’s in 2010. He is a member of the Alzheimer’s Association 2015 National Early-Stage Advisory Group and participates in the Early-Stage Peer to Peer Outreach Program, making calls to newly diagnosed individuals. Bob and Juanita live in Tacoma, Washington. Bob, thank you so much, that is a remarkable article and beautiful story. Something tells me you gave Juanita many wonderful years and she is just doing what we all must do, but it is so encouraging to hear it. Thank you for sharing your story Bob! A wonderful, articulate essay on the special people, who are caregivers! Thank you so much Bob for putting pen to paper to describe just how overwhelming being a caregiver to someone with Alzheimer’s or dementia can be. I’m only 45 and my life has changed dramatically since my mother’s diagnosis a few years ago because I was so active. I use to travel frequently, hang out with friends and attend various social events. Now I’m so mentally and emotionally drained from being responsible for someone else’s life, that it causes anxiety, depression and hopelessness. Part of it is from the realization that there is no cure and she will not get better but progressively worse over time. To see someone you love who was once so vibrant and full of life declining is very difficult to bear. Thank you again for your story and many blessings to you and your wife on your journey. I know how hard it is. I have taken care of my Mother for 10 wonderful year’s and she just passed on Halloween. It will never be the same, I have found that I have nothing to do with my time. It will take time for me to find somewhere to volunteer. Thank you for your insight. Thank you Bob , for your heart felt words. My husband of 53 years has dementia, because of his NPH. We are now, after many doctors appointments, are looking into having a shunt. My husband has been sick for 7 years. I know all about walking down this lonely path. I, like your wife, love our husbands so very much, and we willingly do our caregiving, as it comes from our heart, and can never let them down. It's with deep love and devotion that keeps us going. When words can no longer be expressed, just look into the eyes of your love one, and you can see the love and thanks in return. I wish you many, many days of happiness. Wonderful article Bob. Thanks for sharing. You and Juanita serve as a great example for others afflicted by this devastating disease. I hope your story and inspiration touch many. Do you know of any eARLY STAGE PEER TO PEER groups in my area ? I live in St Charles ,IL My husband was recently diagnosed and I think a peer to peer group whould be of great help to him. Thank you so much for your article You sound like you have had a wonderful marriage. Ours too,has been great 56 years and counting. I want to do whatever I can to show my love and support to my Paul. Hi Bernie, Please go to: http://www.alz.org/. The home page has a box where it asks to enter your zip code. This will list your local alz.org chapter. You can find resources on that page or you can call the local chapter for more information. This will lead you to a link to your local chapter. Just beneath the zip code box there is a menu…if you hover over " We Can Help" a drop down menu will appear. Click on Support Groups and you will receive a listing. Bob, we met once when I took a tour of your complex . You shared kind words and I was so greatful. My husband, (60 ) has been struggling with all the changes to his life due to Alzheimers for 3 years. I miss my husband. We did so much for 28 years and now we are limited with our activities. As a caregiver, I wonder about his support. He has always been private a nd not a complainer. I wonder if he would be assisted in sharing how he feels but he has severe cognitive loss , speech is tough at times. I have started attending a support group but do not like leaving him alone in the evening. How lucky for your community support! Thank you for recognition of caregivers. Thank you, thank you, thank you. I may never hear such words from anyone else, but hearing just once means so much. God bless you and yours. Bob, thank you so much for your story. I am the full-time caregiver for my uncle who as Dementia and Parkinson's. No one's every described how I felt until you. Your story made me cry. I so admire Juanita. My fear is that, with no spouse, children, siblings, no family whatsoever, I'll have no one to care for and love me should this horrible disease (which runs in my family) claims me. Juanita gives me hope that that kind of love still exists. Thank you both. God bless you both. I was a caregiver for my mother who passed this past April.Your thoughts are true ,everything you expressed is how I was feeling.Caregivers are often overlooked when dealing with this disease.I am dealing with my life now one day at a time,now.I have no regrets ,no guilt still recovering myself from all the years of caregiving to my mom ,who I loved very much.I must say there are people out there who do understand,the life of caring for a loved one,but I have found only the ones who have been through this ordeal comprehend ,the life of a caregiver. This brought tears to my eyes – thank you for sharing your story. I live every day in gratitude knowing my siblings are taking great care of my father — and every day in guilt because they are sacrificing so much of their lives to care for him while I live a time zone away…. Bless all the caregiver souls out there. Without them, where would we be? Bob coming from a caregiver myself I can tell you that it teaches you to have a lot of patience. My Mother was diagnosed with Alzheimer's back in 2013 I have been her sole caretaker up until her death on 11/13/2015. It was hard watching her being a strong very organized women just loose interest in cleaning her house or how she dressed, It was a daily job to go there after work and make sure that she ate and wash a load of clothes make sure that she took her medicine but I wouldn't change it for anything in the world. That was that much more time that I got to spend with her that otherwise we would not have spent together. She recently got sick with pneumonia and did not recover I brought her home on hospice on 11/10/2015 and she passed at home with all of her family by her side holding her hand. I dearly Miss her so much that it is hard to function day by day. I am so lost and don't know what to do with myself now that I don't have her to care for or now that I don't have to go to her house everyday. Thank you for reconizing the care givers because it truly is a dedicated job to withhold. God bless and Happy holidays! Caregivers need to understand that they are only human and will get tired, nervous and scared but also always remember the love they have shared with the alz.person and how much is being taken from them and how much stronger you are and can always give the love they so deserve. Stay strong and ask God’s help. Such an inspiring and encouraging story! As the primary caregivers for my 81 year old mom, my family and I work together to give here the best care possible while she's still home with us. Some days are tougher than others but she is such blessing to our family with her sweet spirit. We wouldn't have it any other way! One has to live in a larger community than I do in order to get into a worthwhile caregiver's group. The one time I attended a local group was nothing more than 5 women with seemingly nothing better to do than have what I call a "hen party'. They talked some about their husbands but nothing worthwhile, to me at least. I was the only man there. My wife only has dementia which I guess isn't as important as Alzheimer's. I'm watching my wife of 51 years go downhill into that 'never to return' land and it's very sad. I am also a caregiver, and what you said is so true. You do feel isolated and alone. My husband will not let me out of his site, so therefore, no one can stay with him and let me have some me time. Thank you for your story, it helped me to realize I'm not alone. I plan to keep my husband at home until the end, with God's help. Linda B. My husband was diagnosed at age 55 one year and a half ago. It was a complete shock. At that time he was recovering from a surgery. In the midst of his 12wk recoup, his employers made us aware that they felt he should no longer continue to work because of his memory issues and his risk of lawsuits. We then proceeded to testing for neurological issues and three months later the diagnosis of early onset Alzheimer's. His decline is fast and it has been a turbulent time for both of us and our 18 yr old still at home. He exhibited paranoia with delusions for first time last month and disappeared for 5 1/2 hours with his car. I in fact had to call police to locate him. We thought best to keep his keys out of sight so he doesn't endanger himself or other drivers. He has not been accepting of his diagnosis and there are days of anger and frustration. He wants his keys one day and the next day it is my fault he is not working. The emotional turmoil is the worst. And I know it is the same for him as he probably doesn't understand what is wrong with him. He was unwilling to go to the early onset therapy as a couple and does not do any research on the disease. There are calm days, too. But I can almost see it in his eyes when it's going to be a bad day. I have family near, some of who are nurses and help support me and our family doctor and neurologist. But he relies on me to be with him all the time. I don't feel I can leave him home alone in case he has a delusion. I do appreciate the ALZ 24 hour help line, and our area has an early onset director who has counseled me over the phone. And has also sent me invaluable information on this disease. But as caregiver, feeling overwhelmed is an understatement some days and it is so important to have support from family and professionals. I would also appreciate knowing other caregivers for those diagnosed at early age and to hear of their experience. but kaiser seems disinterested in giving us a cause for her dementia. My father was recently diagnosed with dementia. He’s doing well, but some days are tougher than others. Thanks for the great read this evening.